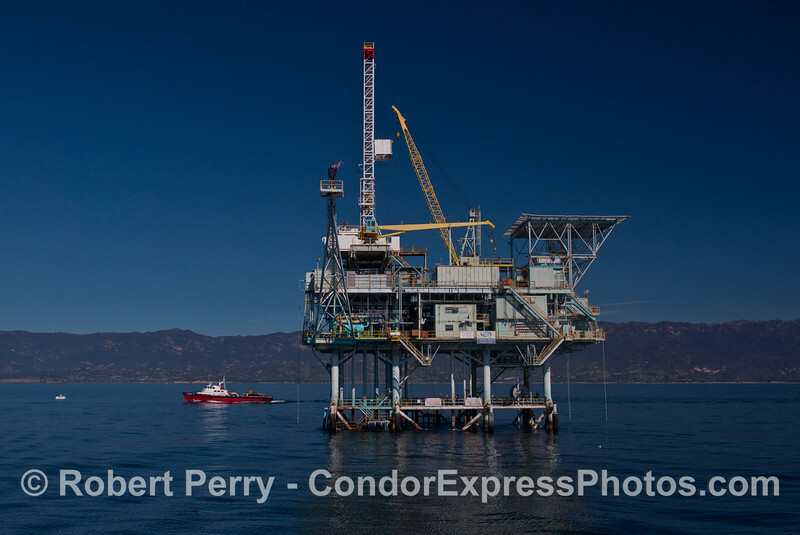 We departed Santa Barbara Harbor under clear blue skies with warm temperatures. 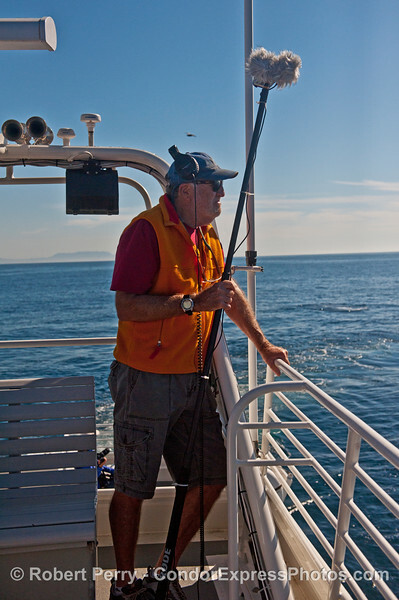 Once away from shore we found mill pond glassy seas. Very quickly we were hopping from hot spot to hot spot, no more than a few miles from shore, and the water was crystal clear and blue in color. 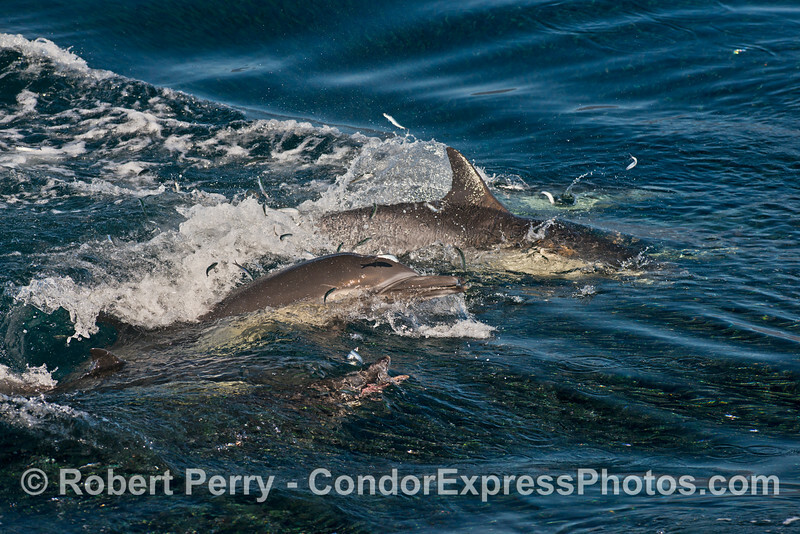 Although there were some nice anchovy schools in close to shore, and a few common dolphins were seen feeding upside down on these fish, the "real" show began just south of Platform Hogan. 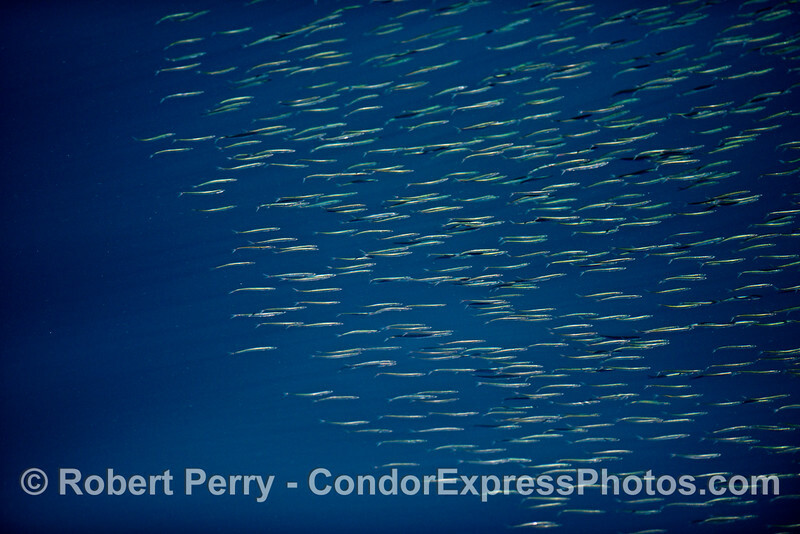 Here the anchovy schools were absolutely massive...millions and millions of tiny silvery fish flowing like a living river and then being forced to group up into a tight ball by the dolphins and sea lions. 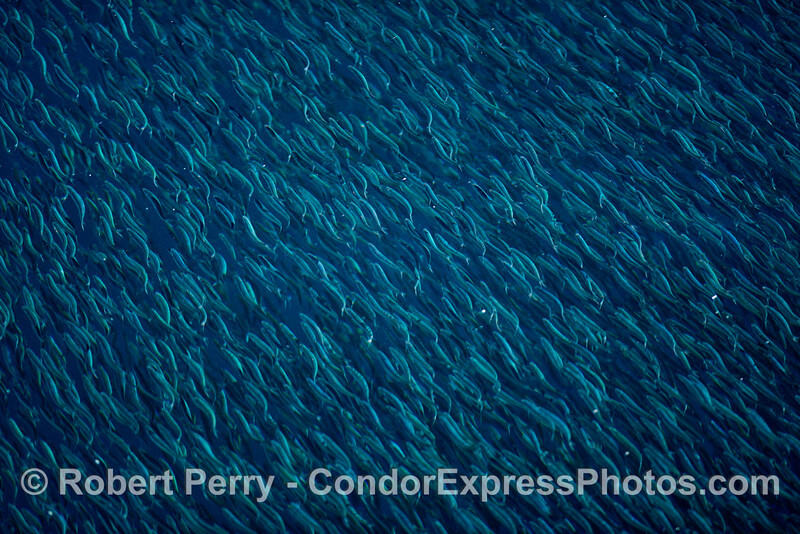 This huge river of silvery fish frequently attempted to seek refuge in the shade of the Condor Express, with little luck. 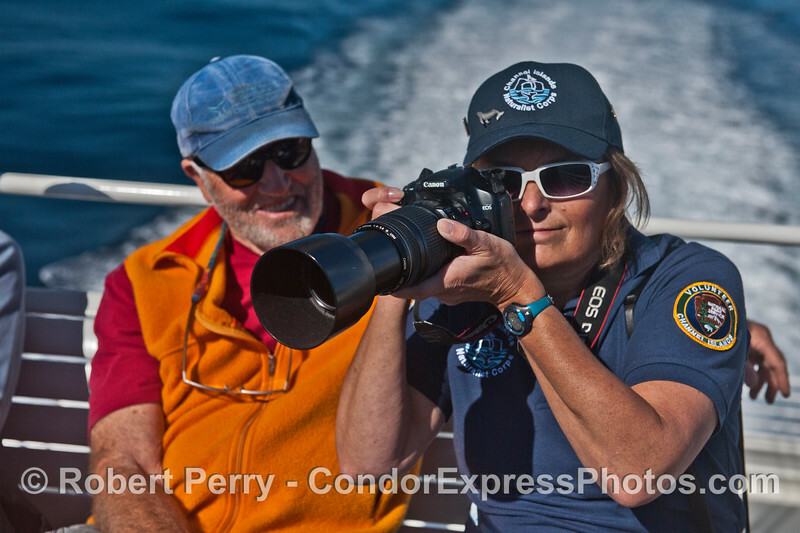 It did give all whale watchers some spectacular close up looks at hungry common dolphins, sea lions and sea birds gobbling down anchovies. 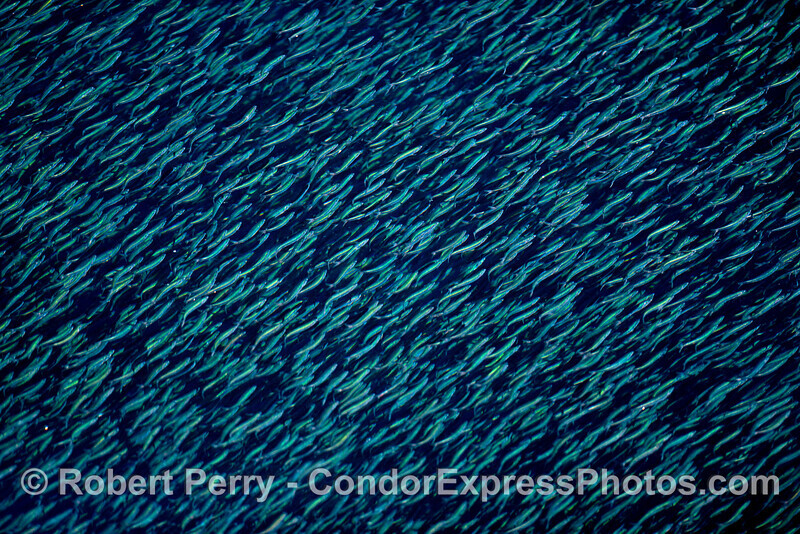 One image stands out in my mind's eye of the river of anchovies fleeing cooperatively feeding dolphins, hitting the hull of the Condor Express and rolling off like a perfect living wave. 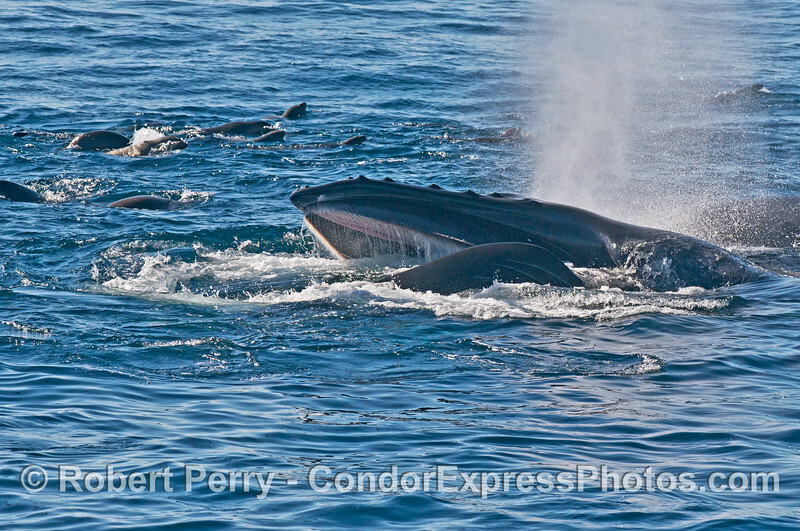 Soon the massive bait schools attracted 4 or more Minke Whales. 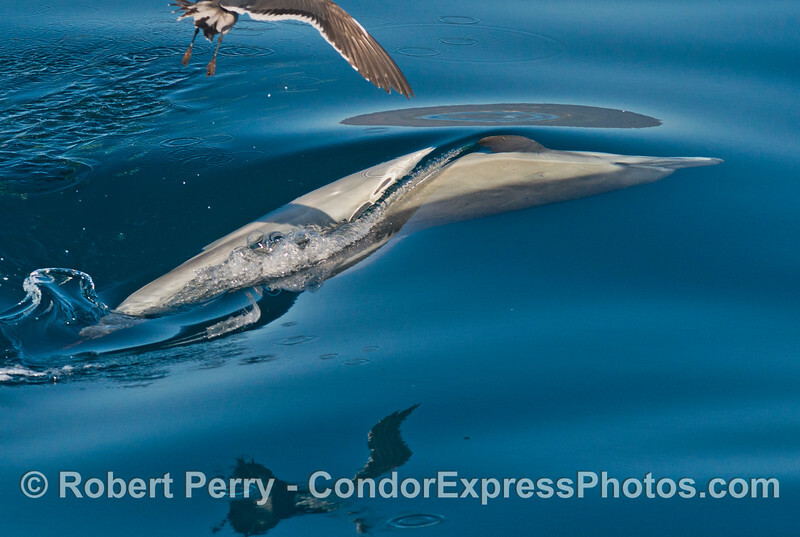 Rather than some typical fleeting glimpses of Minke dorsal fins, today the Minkes were actively surface lunge feeding, and at one point did so pretty darned close to the Condor Express so you could look inside the mouth. Moreover, the Minke would then turn over so it was oriented normally, and dive in the clear water so close to us you could clearly see (and photograph !) the expanded ventral groove blubber and a bubble stream leaving the closed lips. I've seen tons of Minkes before, but nothing like this. 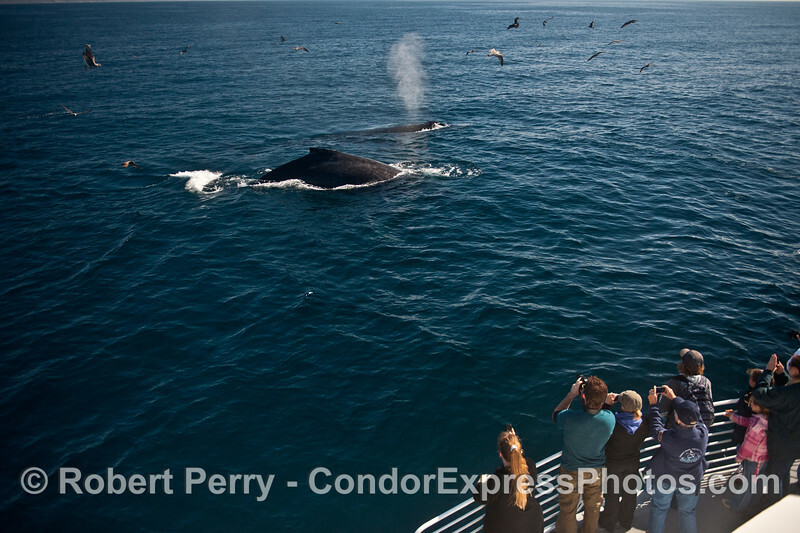 Not far south of these monster anchovy schools and feeding Minke whales, we found two groups of surface lunge feeding humpback whales. First a nice hungry pair, then a trio. Again the little silver fishes did not have much of a chance. 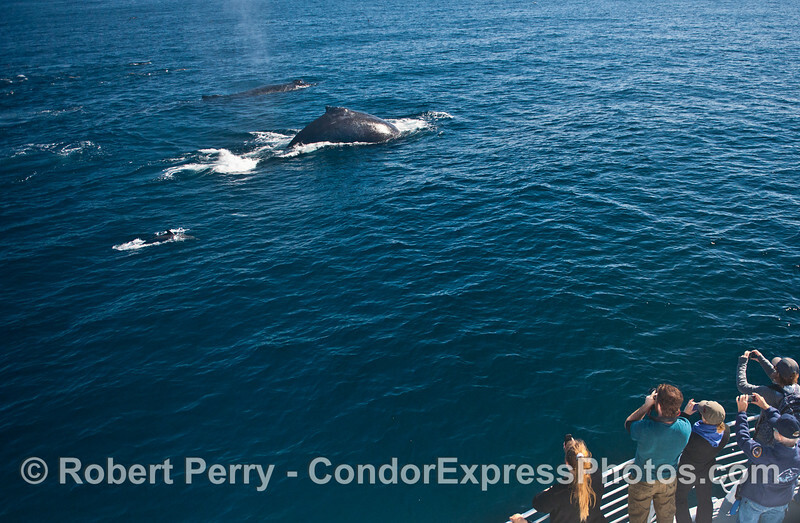 One of the initial duo was "Rope Junior," the newly discovered, smaller version of our big female humpback friend "Rope." Both have similar entanglement scars. Later Rope Junior breached and got everybody's heart thumping. 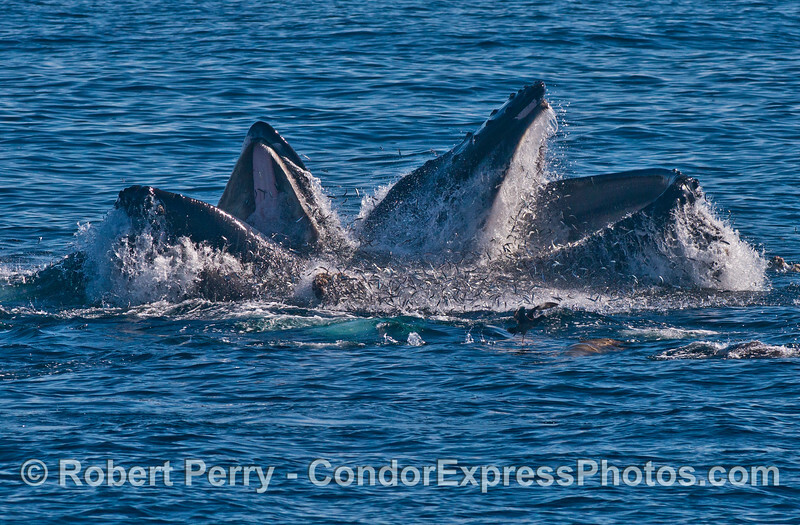 In addition to the surface lunge feeding, and Junior breaching, we had a monstrous double breach later in the day. It came out of no where and (excuses, excuses) I did not capture it on disk. 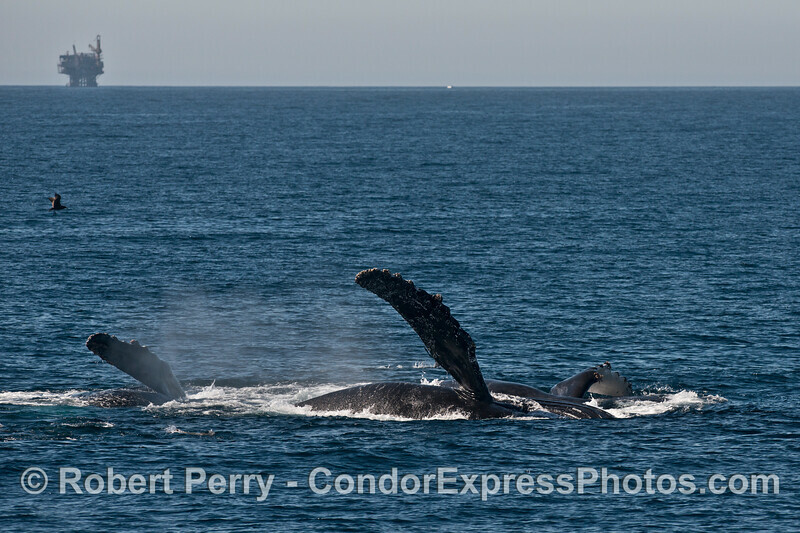 Several of the whale watchers had better luck paying attention and did get the double breach imaged. 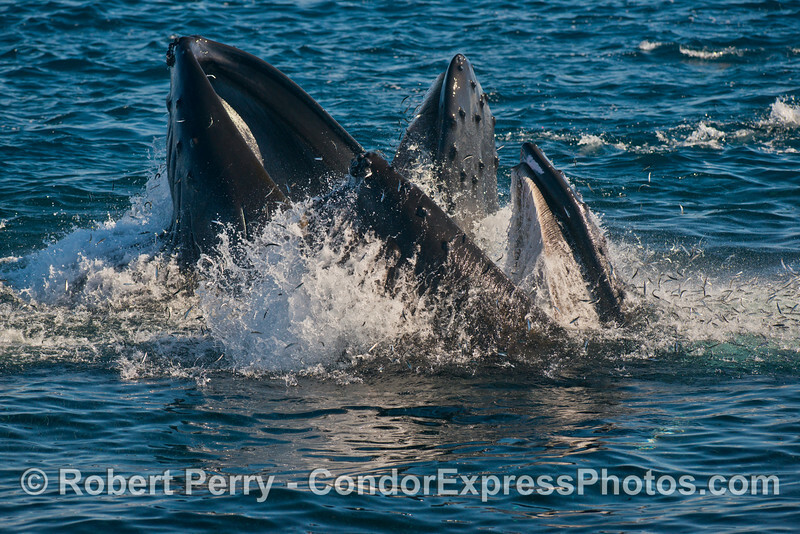 There was one nice episode of tail throwing, a lunge feeding event with two humpbacks upside down on the surface, pectoral wings akimbo, and several very close and friendly approaches. You can click on "Map This" and see where we took pictures. 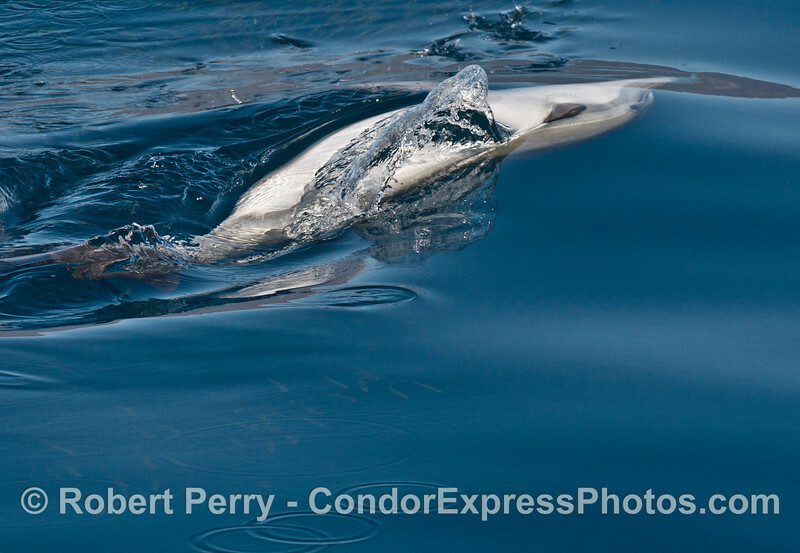 Image 2 of 3 in a sequence: a long beaked common dolphin (Delphinus capensis ) feeding upside down on a school of northern anchovies (Engraulis mordax). 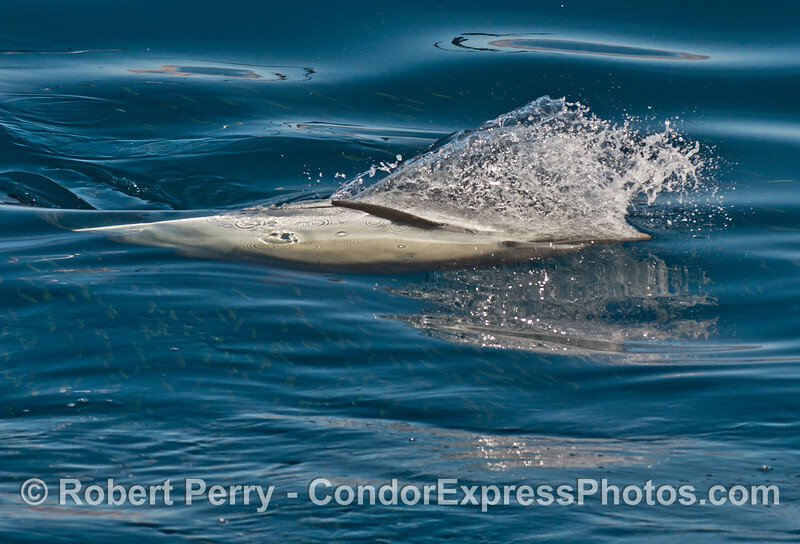 Image 3 of 3 in a sequence: a long beaked common dolphin (Delphinus capensis ) feeding upside down on a school of northern anchovies (Engraulis mordax). 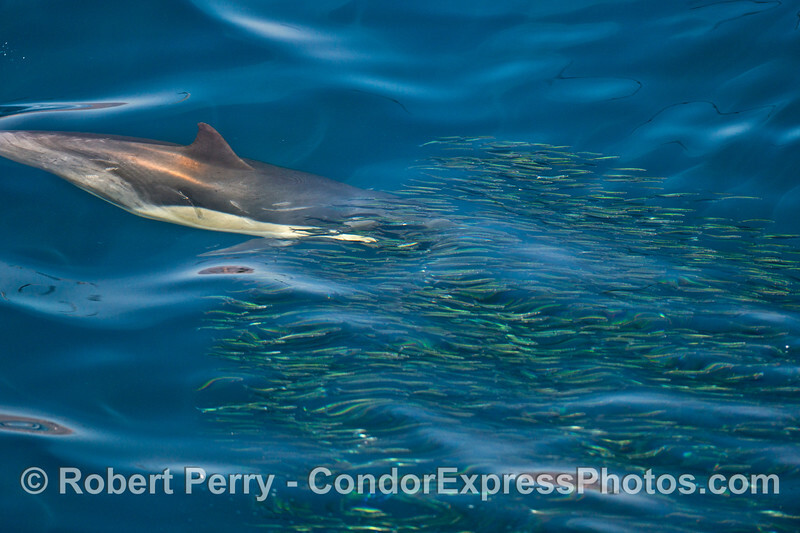 Another long beaked common dolphin (Delphinus capensis ) is shown feeding upside down on a school of northern anchovies (Engraulis mordax). 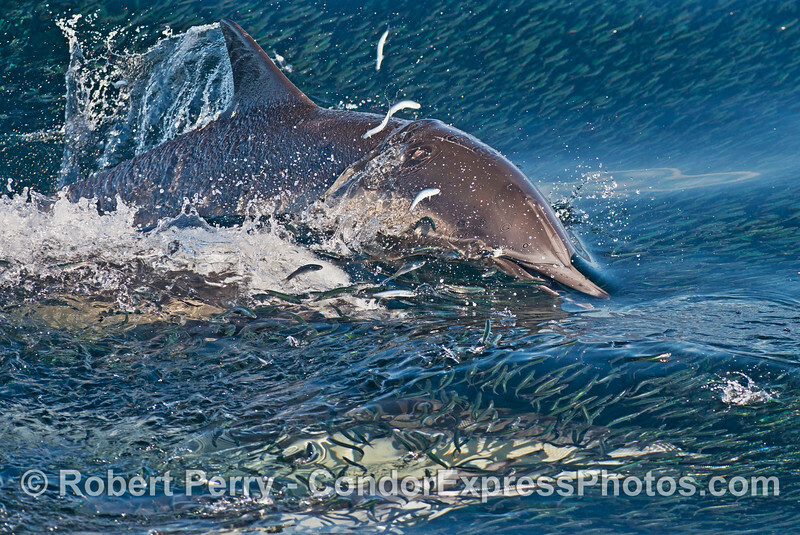 A pack of hungry long beaked common dolphins (Delphinus capensis ) attacks a school of northern anchovies (Engraulis mordax). 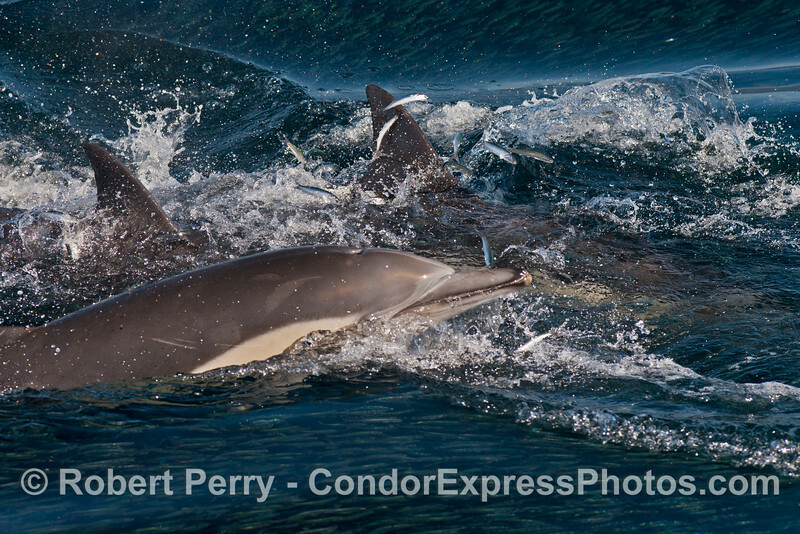 A pack of hungry long beaked common dolphins (Delphinus capensis ) sends northern anchovies (Engraulis mordax) jumping for their lives. 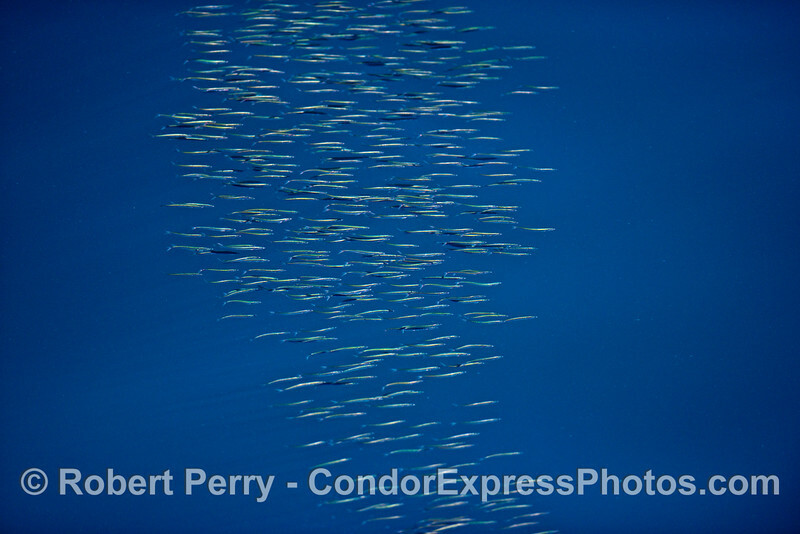 A school of northern anchovies (Engraulis mordax) with a predatory common dolphin (Delphinus capensis ) seen in very blue water. 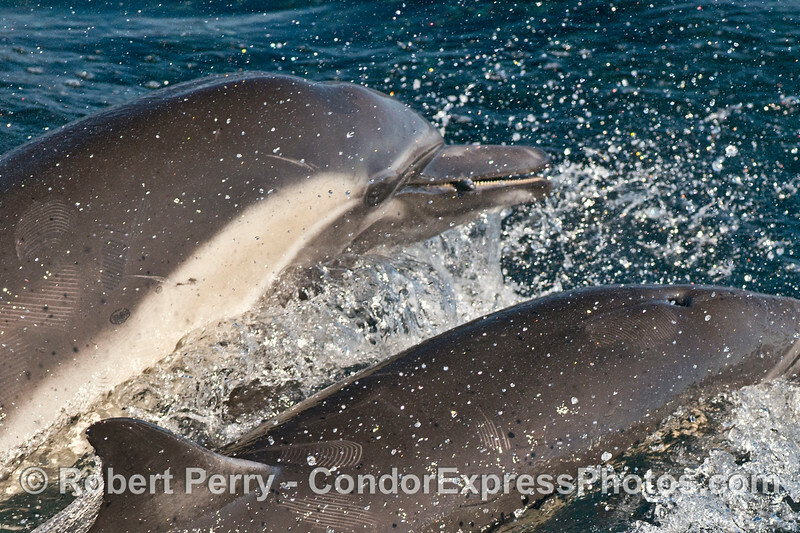 A northern anchovy (Engraulis mordax) is captured in the teeth of a common dolphin. 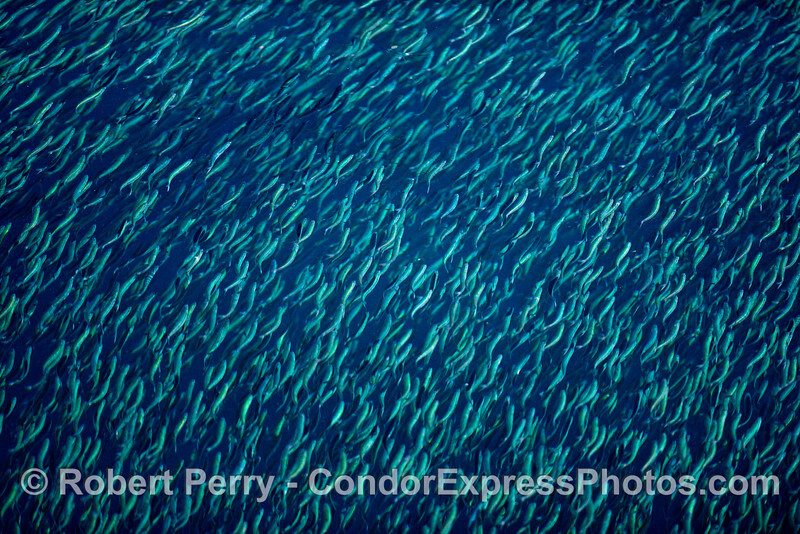 A small portion of a massive school of northern anchovies (Engraulis mordax). 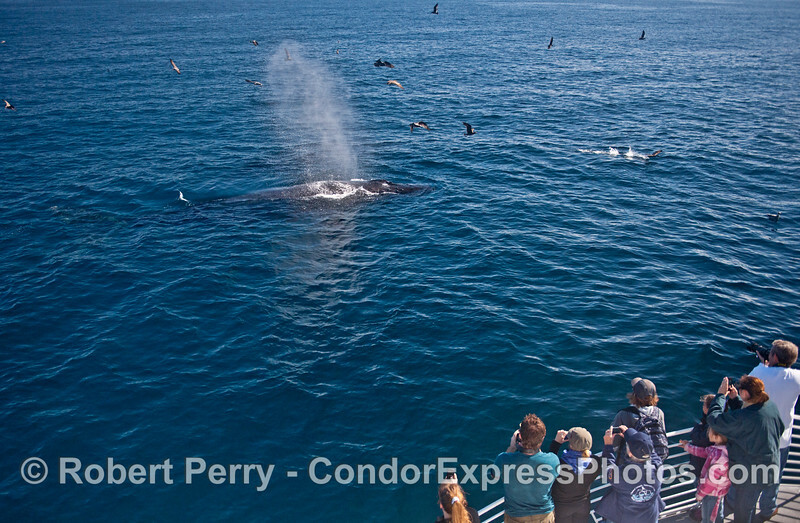 Humpback whales (Megaptera novaeangliae) make a friendly approach to the delight of all. Humpback whale (Megaptera novaeangliae) tail fluke. 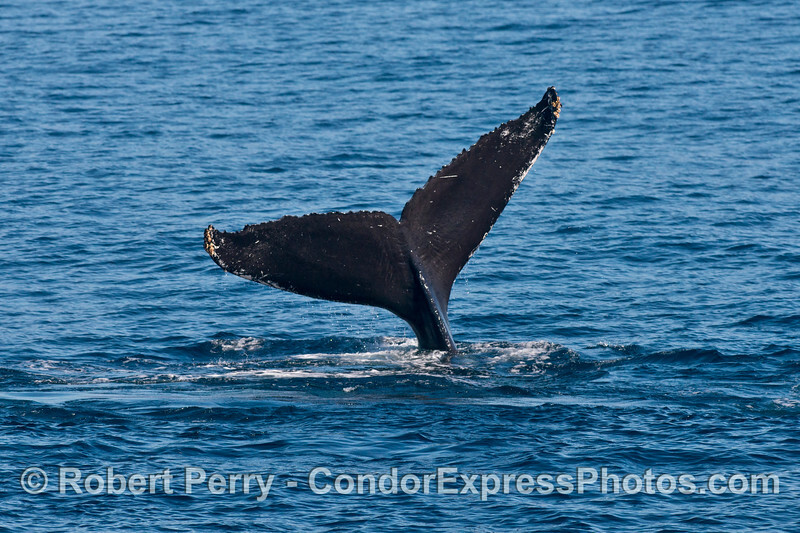 Humpback whales (Megaptera novaeangliae) make a friendly approach and show their tail flukes. 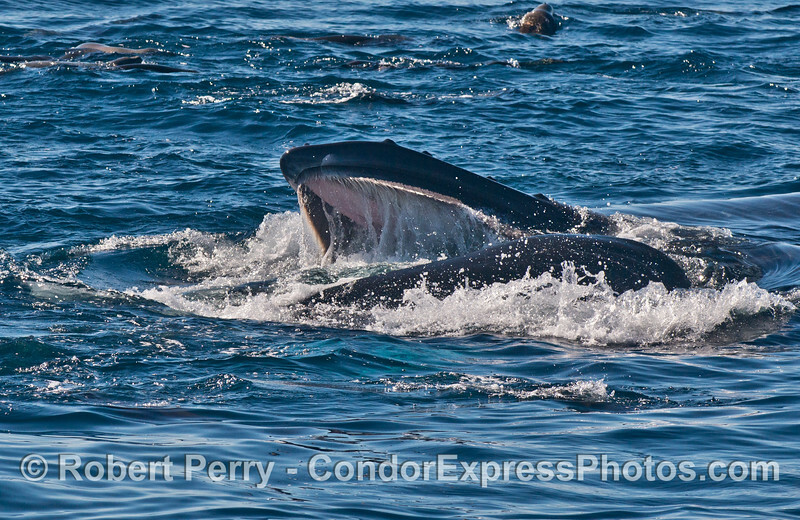 Two humpback whales (Megaptera novaeangliae) seen rolling around on the surface. Close view: Humpback whale (Megaptera novaeangliae) tail fluke. 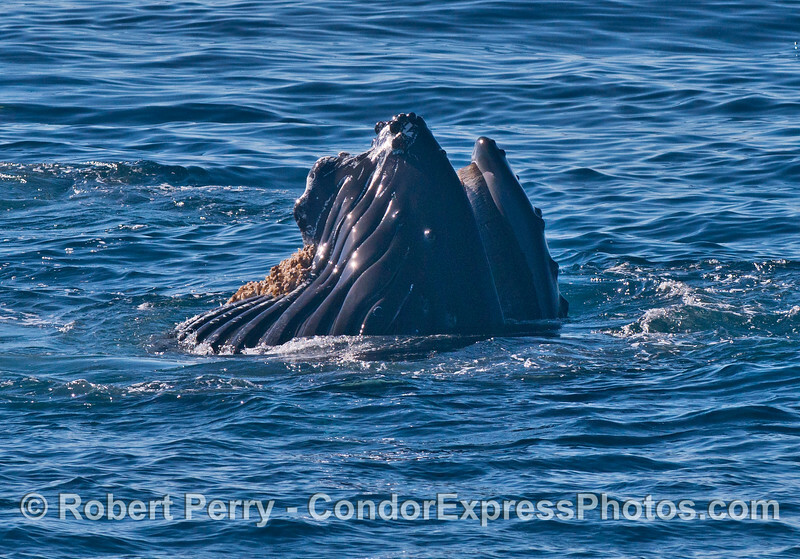 A newly observed humpback whale (Megaptera novaeangliae) with an entanglement scar similar to our old friend "Rope." 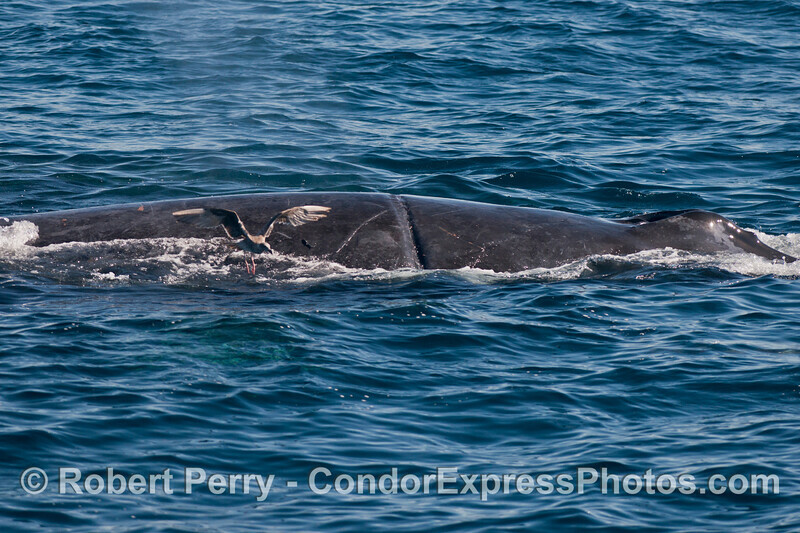 We call this smaller whale "Rope Junior." 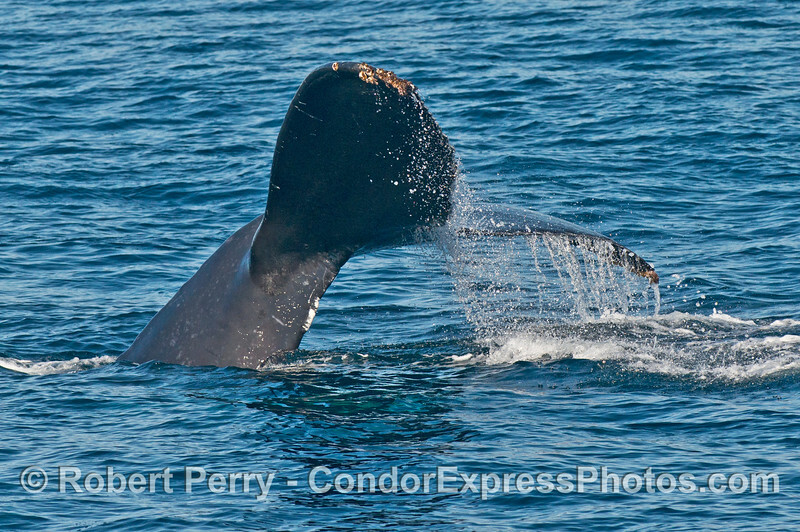 A surface lunge feeding humpback whale (Megaptera novaeangliae) showing baleen in the bright sunlight. 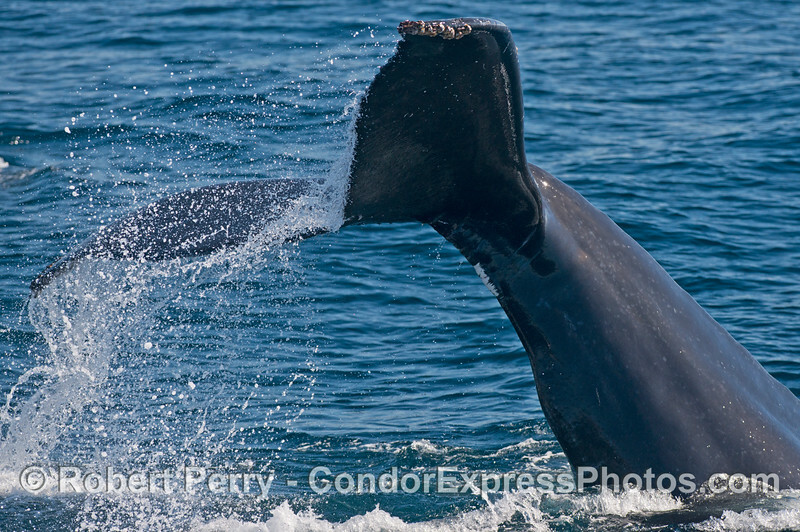 A vertical lunge feeding humpback whale (Megaptera novaeangliae). 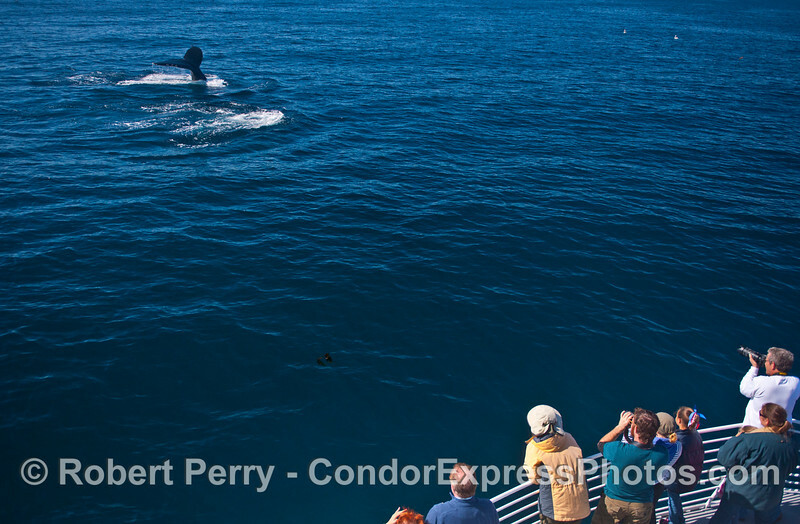 Two vertical lunge feeding humpback whales (Megaptera novaeangliae) and a curious sea lion. 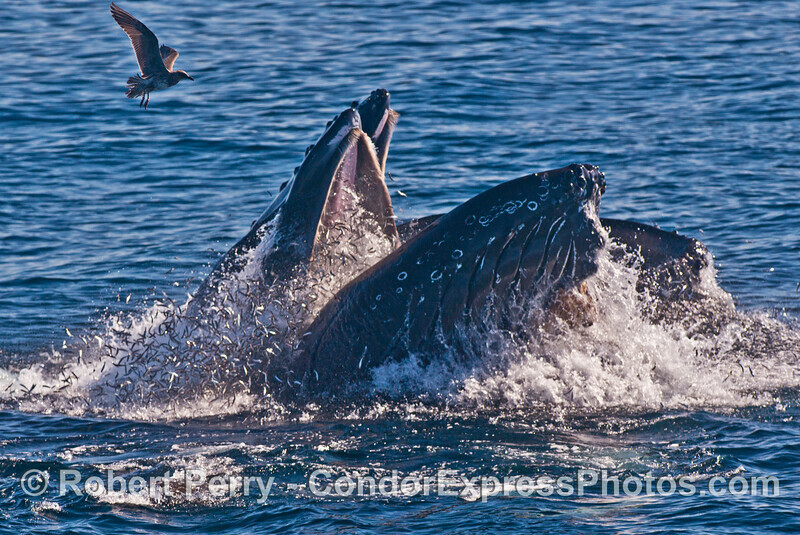 Two vertical lunge feeding humpback whales (Megaptera novaeangliae) send the anchovies flying. 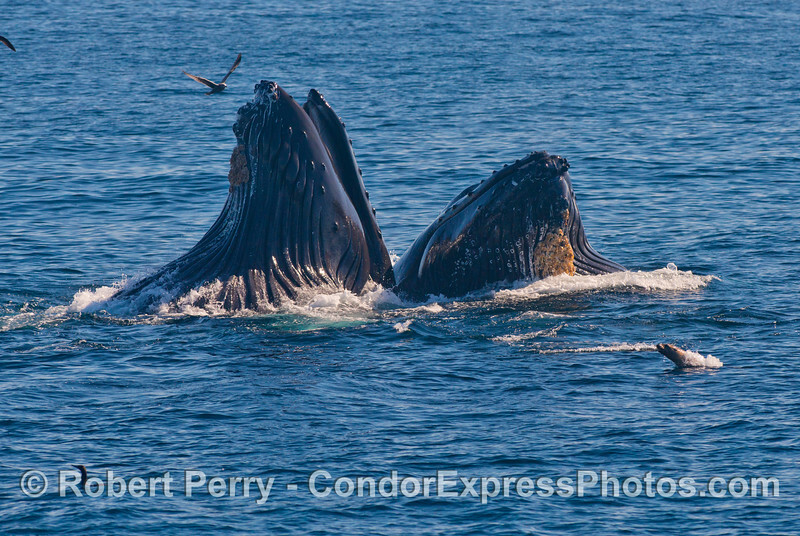 Two vertical lunge feeding humpback whales (Megaptera novaeangliae). 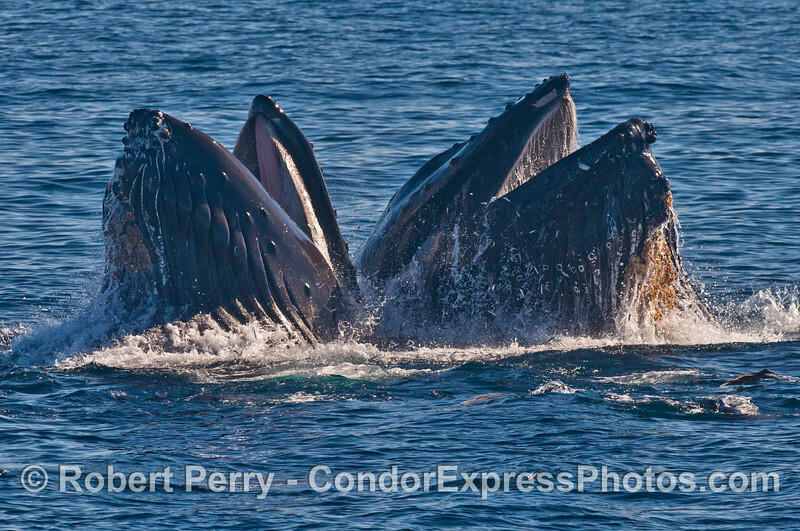 Criss cross - Two vertical lunge feeding humpback whales (Megaptera novaeangliae). 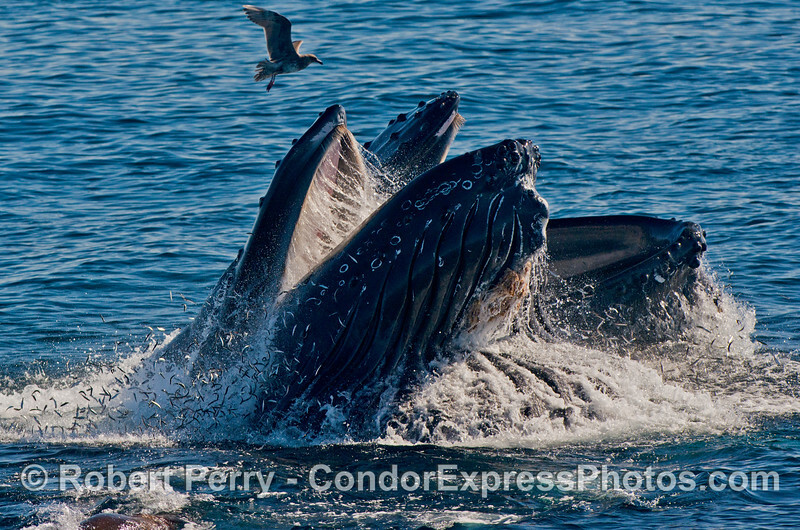 Thousands of anchovies flee as two vertical lunge feeding humpback whales (Megaptera novaeangliae) gulp them down. 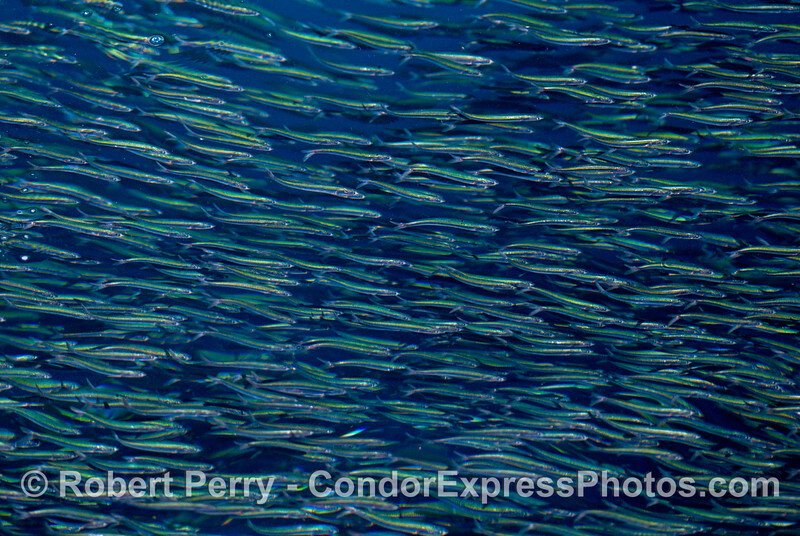 Note the sea lion right in the middle of the anchovies. 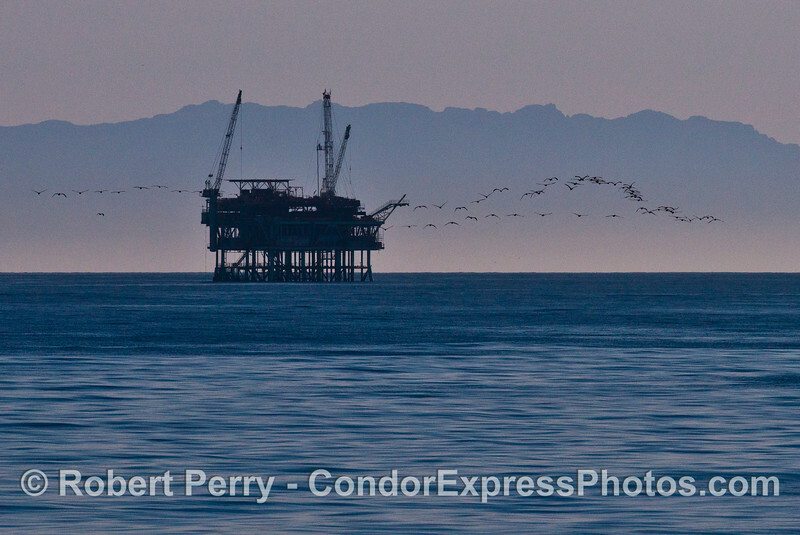 Platform Hogan with a flock of brown pelicans (Pelecanus occidentalis) and Boney Ridge in the background. 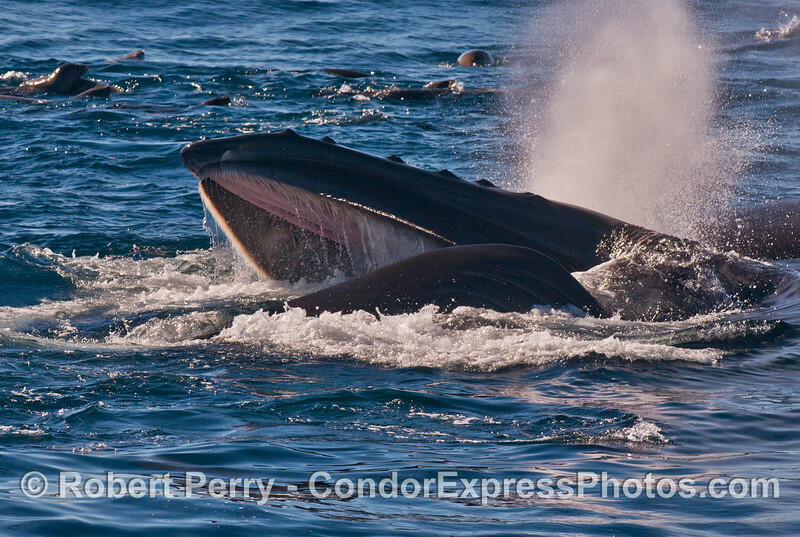 Two vertical lunge feeding humpback whales (Megaptera novaeangliae) with thousands of anchovies trying to escape. 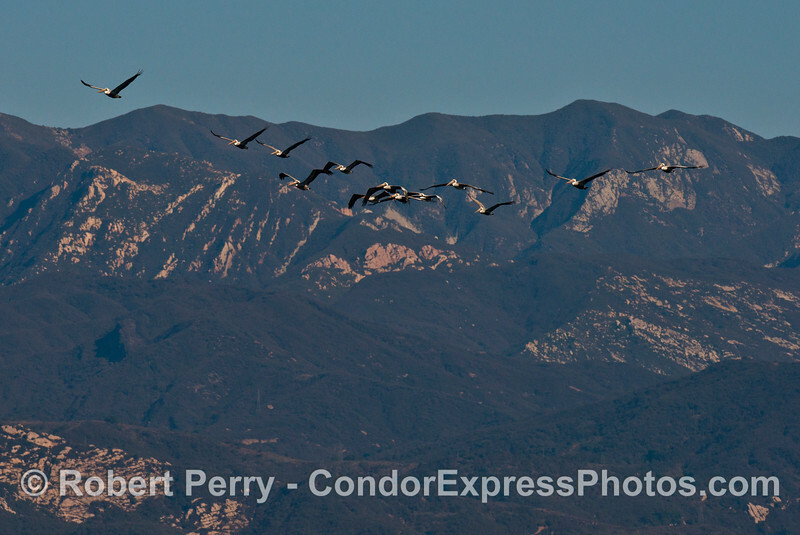 The Santa Ynez mountains with a flock of high flying brown pelicans (Pelecanus occidentalis). 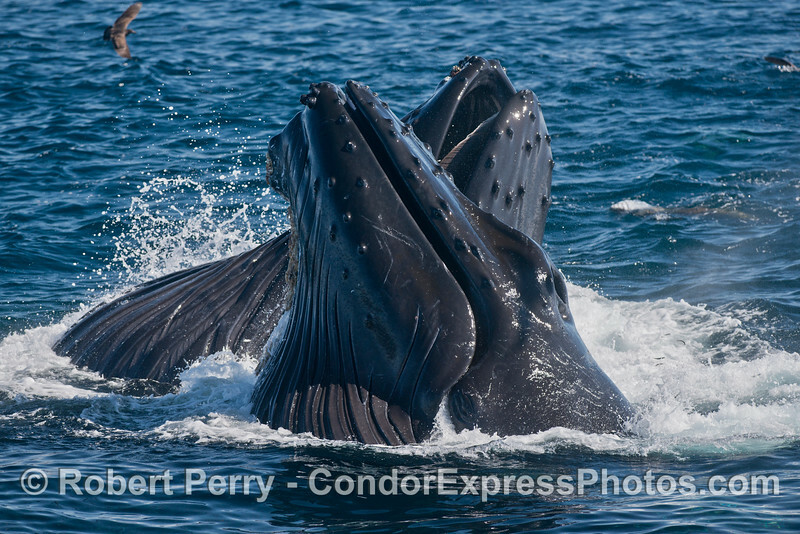 Friendly humpback whales (Megaptera novaeangliae).